Violent clashes between police and protesters yesterday in Kiev mark an escalation of the campaign by the pro-Western opposition to oust Ukrainian President Viktor Yanukovych. The opposition, backed by the United States and German governments, aims to install a far-right regime committed to integrating Ukraine within the European Union and implementing its demands for austerity measures. Bloody street-fighting erupted when opposition protesters marched on parliament, demanding it pass a planned law to decrease Yanukovych’s powers. When the vote went against them, the opposition supporters attacked the headquarters of the ruling Party of the Regions. Clashes between police and protesters erupted and spread throughout the city. The unrest has been the bloodiest since the pro-EU protests began some three months ago. Latest reports indicate that at least 19 people have been killed, including police and protesters. Hundreds, possibly thousands, have been injured, at least 200 people seriously. The opposition demonstrators, many of whom are affiliated with the neo-fascist Svoboda party and other extreme right-wing groups, appeared to be heavily armed. One of the fascistic organisations involved, Right Sector, called for all those with arms to take them to Independence Square and engage in combat with the authorities. Media footage shows anti-government protesters, some wearing helmets emblazoned with fascist symbols, firing rifles and small arms at riot police, as well as throwing molotov cocktails. During the storming of the Party of Regions headquarters, they killed at least one office worker. Several interior troops were reportedly taken as “prisoners” before government forces secured control of the building. Opposition leaders called on supporters to continue fighting. Vitali Klitschko, head of the UDAR (Punch) party, which has close ties to the German state, demagogically told demonstrators: “We will not leave here. This is an island of freedom. We will defend it.” Violent clashes continued throughout the night and early Wednesday morning, paralysing the city. 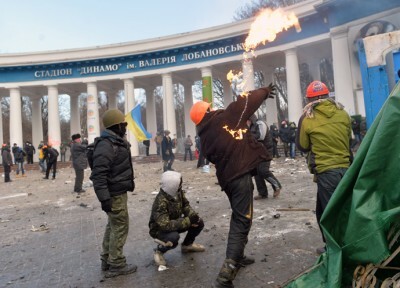 The bloody scenes in Kiev are the direct result of the campaign waged by the US and Germany to oust Yanukovych after he rejected proposals for closer EU ties and signed a deal with Russia accepting financial aid. In their efforts to prise Ukraine out of Moscow’s orbit and isolate Russia, Washington and Berlin are openly working with the extreme-right parties. The protests and violence in Kiev followed a meeting in Berlin on Monday in which opposition leaders Klitschko and Arseniy Yatsenyuk called on top German officials, including Chancellor Angela Merkel, for greater support, including to press for sanctions on the Ukrainian government. Also on Monday, Russia agreed to purchase $2 billion in Ukrainian bonds, giving the Yanukovych regime a financial breathing space that would have been unwelcome in opposition circles as well as in Berlin and Washington. The US and German responses signal an intensification of the imperialist drive to install a puppet regime in Kiev and transform the Ukraine into a bastion for further provocations and intrigues aimed at dismembering Russia itself and reducing it to a dependent semi-colony. The promotion of right-wing Ukrainian nationalists is part of a broader strategy of exploiting the many ethnic, national and religious divisions within the former Soviet Union to secure dominance over the region. The subordination of Ukraine is one of the longstanding geo-strategic ambitions of German imperialism, stretching back to World War I. Germany’s current aggressive policy toward Ukraine coincides with the revival of German militarism. At the recent Munich Security Conference, top German officials stated that the time had come when Berlin had to abandon the post-war restraints and restrictions on the use of military force. US imperialism has pursued a relentless strategy of weakening and isolating Russia for more than two decades since the collapse of the Soviet Union in 1991. Starting with the wars in Yugoslavia in the 1990s, Washington has encouraged and supported so-called colour revolutions in the former Soviet republics. It invaded Afghanistan to establish a base of operations into Central Asia and sought, through sanctions and military threats, to carry out regime-change in Iran and Syria, Russia’s closest allies in the Middle East. The ability of imperialism to intervene aggressively is the direct outcome of the dissolution of the Soviet Union, the restoration of capitalism and the opening up of the former Soviet republics to the plunder of global transnational corporations. In opposing the present imperialist intervention in Ukraine, no political support should be given to Yanukovych or Russian President Vladimir Putin, who represent corrupt, grasping oligarchs who have enriched themselves at the expense of the working class. The only social force capable of opposing the imperialist intrigues, military threats and drive to war is the international working class. The starting point is a rejection of all forms of nationalism and a political fight to unify workers in Ukraine with their class brothers and sisters throughout Europe, Russia and internationally. That requires a common struggle to abolish the bankrupt profit system and establish a planned world economy to meet the pressing social needs of all.